I have had a few folks asking me about a Tablet preferences of iPad vs this or that. But it is not that easy. For now as of 12 April 2011, there are 4 tablets worth really considering, and a few more soon. I made a conscious descion a while ago to avoid the Android Google world. But with new versions out I am being tempted more than ever. I ditched my iPhone some months ago and I must admit I do miss it often as I have an iPad. This is relevant as I have not seen a good phone, that plays well with another manufacturer tablet operating system, and having 2 inventories of apps to keep up with is a pain. In this day and age where our pc, mobile phone, and tablet are all part of our lives having them not play well togethermakes life hard. I realised this when my windows phone 7 phone, did not do much, an idea I kind of liked, but now feel very inhibited. But the apple iPhones are feeling rather dated as well. So I have a new Google Motorola ATRIX, arriving soon, the latest mobile not out in Australia yet and an android. This might mean I also cosider ditching my iPad in favour of an android tablet, we will see. I hear the Andoid store is a mess as there are so many versions of android, that you cannot tell when you purchase an app if it will work with your device or not. That is silly, I will see in my next review how good or bad the andoid app library is. The other thing to consider is iTunes. I hate iTunes as much as I love my iPad. But you need it really to manage the iPad. Again this is relevant because I think keeping to one platform for phone and tablet might be the best way to go. If you own an iPhone and plan to keep it, I would stay with iPad. If you are considering seriously getting a tablet other than an iPad (as I am now), then you seriously might want to consider a phone form the same operation system, if you have or are considering an Android phone, you have more choice available on the tablet from but I think the Motorola XOOM is one to watch. All the tablets have their own merits and flaws, here is a view of all 4. Well, it’s finally here. 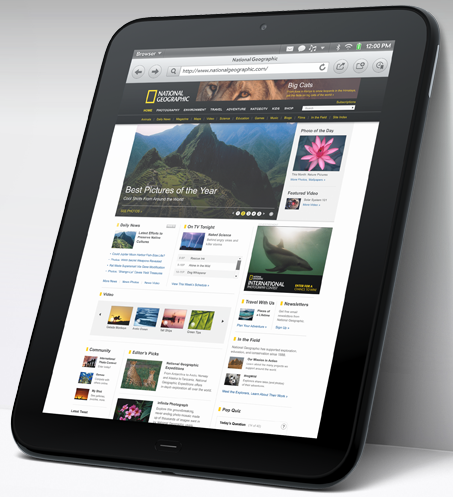 Apple recently launched the anticipated 2nd-generation iPad. With Google’s Android, RIM’s BlackBerry powered PlayBook, and HP’s webOS getting fancy new tablets either recently or in the future, buyers are going to be spoilt for choice when it comes to selecting a new slate device. We thought we’d take a closer look at the iPad 2′s four main competitors in the tablet space: Samsung Galaxy Tab 10.1, Motorola Zoom, HP/Palm’s TouchPad and BlackBerry PlayBook. First up we’ve got the new kid on the block, Apple’s iPad 2. Announced by Steve Jobs to be powered by a dual-core CPU that’s supposedly twice as fast as the current iPad. The new graphics chips are ’9x faster’ too. Impressive, at least on paper. In typical Apple fashion, we don’t have actual figures other than the usual dimensions. Thickness? 8.8mm. That’s one third thinner than the current model. Interestingly, the new iPad 2 features two cameras, one rear and one front facing and the most interesting specification of them all is the availability of the new white iPad. Apple couldn’t get a white iPhone 4 out the door but no such issues with the iPad 2. Samsung showed off its new Galaxy Tab 10.1 at this year’s Mobile World Congress in Barcelona, with the new tablet hoping to build on the success of its smaller sibling. Sporting a new 10.1-inch 1280×800 display (hence the name), the new Tab boasts some impressive specifications. Powering that new screen is a 1GHz dual-core Tegra 2 CPU with both front and rear facing cameras providing the video input. The Tab’s rear camera is capable of HD video recording and has the now obligatory in-built flash. 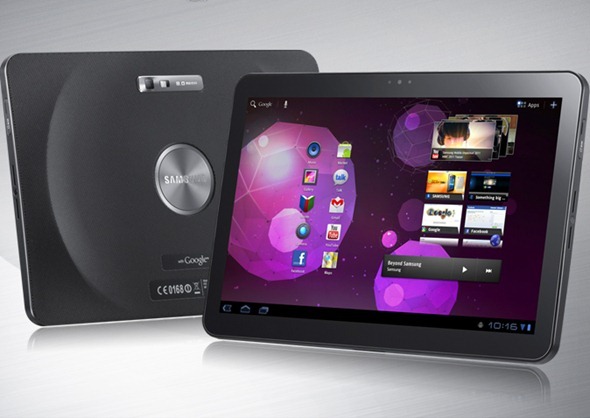 Software-wise, the Galaxy Tab 10.1 will run the latest and greatest from Google’s Android stable, namely 3.0 Honeycomb. Another Honeycomb-endowed offering is Motorola’s Xoom. Recently released in the United States, the Xoom has been very well received by the gadget press. Arguably a very similar machine to the Galaxy Tab 10.1 – at least spec-wise – the Xoom’s party piece is its LTE capability. The downside here is the wait. Early-adopters will need to send their unit away for a hardware upgrade in order to take advantage of LTE speeds. Fortunately a quick turnaround is promised by Motorola, with 6 days the expected wait. With the Xoom being powered by Google’s Android OS in its latest Honeycomb guise, there is little to differentiate it from the Galaxy Tab 10.1 when it comes to software. The main difference? The Xoom is in stores now! Originally expected to go under the Palm name, the TouchPad will run on a new version of webOS. Now at version 3.0, webOS is promising to be a truly tablet-optimized experience. Even during the Pre’s death-throws, many believed the OS was the phone’s best attribute and a tablet was always the logical home for a future updated version. HP isn’t scrimping on the hardware front either. A 1.2GHz Qualcomm Snapdragon dual-core CPU is the heart of the machine, with 1GB of RAM keeping the CPU busy. An iPad-like 9.7-inch 1024×768 screen is used, along with all the usual radios we’ve come to expect, including a 4G one. The TouchPad does sport a front-facing camera, though there’s nothing around the back. With PlayBook, Research In Motion (RIM) is the fourth major platform (in no particular order) after Android, iOS and webOS to enter the Tablet Wars. 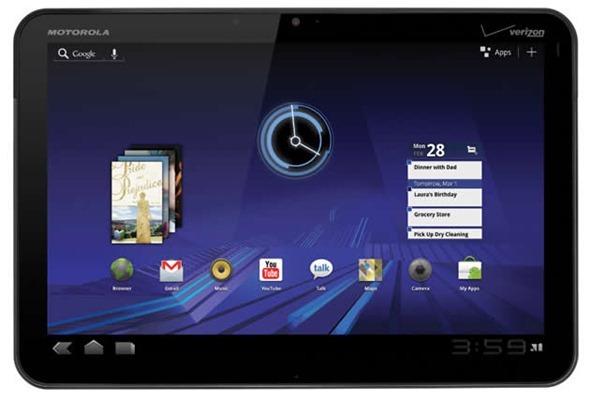 PlayBook features 1Ghz dual-core processor, 1GB RAM, 1080p HD video playback and HDMI output. Powered by BlackBerry Tablet OS with UI designed by QNX, RIM’s PlayBook is expected to hit retail shelves in April this year. Which device you ultimately stump up for very much depends what you want from a tablet device. Apple’s iPad 2 has the massive advantage of being tied into the largest App Store on the planet, though many would also consider that to be its biggest weakness. If you’re the tinkering type, and prefer the more gritty approach of Android then the Xoom or Galaxy Tab 10.1 will be right up your street. The Android Market is constantly growing though the quality of apps perhaps isn’t quite there just yet, and Honeycomb promises a new raft of software specifically designed for tablets. HP’s offering is a real unknown at this point. A new OS, with new hardware from a company that hasn’t done well with mobile devices in the recent-past could prove disastrous though we doubt it. What we’ve already seen of the TouchPad looks mighty impressive, and the thought of webOS on a 9.7-inch screen excites us. Same goes for RIM’s BlackBerry powered PlayBook. Will there be enough apps for HP’s new tablet or RIM’s PlayBook? That’s the real question. Ultimately the decision as to which tablet is right for you is a personal one. Many will plump for the safety and security of iOS while others want the power of Android. A few will even want to take a chance on the TouchPad or PlayBook, and who could blame them? We’re not sure where our money will be going, but today’s iPad 2 announcement sure makes for an interesting few months ahead. Is 2011 the year of the tablet? You betcha!